A new month brings a notable re-shuffling of the 10 games most avidly played on the Nintendo Wii. Animal Crossing and Call of Duty climb — and did you notice that only four of these games are made by Nintendo? 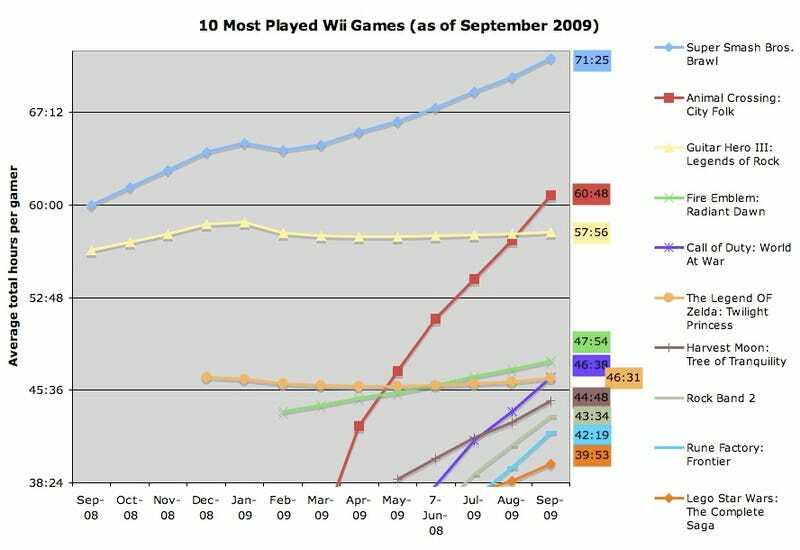 An explanation of how Kotaku arrives at these figures is below, but the short version is that this chart demonstrates which games have, since their release, garnered the most playing time, per player, among a population of more than 2.6 million Wii gamers. This is less a popularity contest than one of customer satisfaction. Call of Duty: World at War continues to rise, reaching an hours mark that vastly exceed the length of its campaign. That is likely a testament to the game's offline and online multiplayer. Since last month, Animal Crossing has advanced to the number two spot and looks like it has a shot at passing Smash Brothers. In the comments to these posts, some readers scoff at games such a Wii Sports and Wii Fit for not making it in. Wii Fit would indeed be far lower in the chart, having averaged 19 hours and 22 minutes per player as of September 1. But Wii Sports, a game that has logged more than 77 million sessions across all the players whose stats are being tracked here, just missed the top 10 with a superb average total playing time of 37 hours and three minutes. There are several impressive near-misses. Mario Kart Wii is at 33:51. FIFA 09 is at 31:57. WWE Smackdown Vs. Raw, in a showing that surprised me, is at 30:51. In addition to the first Rock Band, Guitar Hero World Tour, and Tales of Symphonia, those are the games that currently crack 30 hours of average playing time. They're a diverse set, full of games both high-selling and low, mostly supported by addictive multiplayer modes but a minority boasting merely one very long solo quest. These numbers don't offer publishers a blueprint of what kind of games to make. Some of these avidly-played games are owned by just a small group of niche fans. But the numbers do show what kinds of games can hook players. That is valuable information for any game-maker that wants to consider offering add-on content, cultivate a loyal fan community or identify which kinds of multiplayer modes succeed in offering long-term value. As always, I'll break out some more Wii numbers in the coming days. Expect the next Top 10 report in early October. And for those who are curious, Wii Sports Resort, which was too new to chart by August 1, was averaging 14 hours and two minutes per player by the first of this month. Where's all this from? (AKA an explanation of the above chart for stat junkies only): In a move somewhat surprising for the generally secretive company, Nintendo makes all of this data public. Any Wii owner can download the Nintendo Channel to their Wii and begin browsing for games. Any game that has been played enough times has usage stats listed for it, contributed by anyone who chose to share their data with the channel. The sample size that the channel tracks is pretty good. We calculate it by looking at Wii Sports usage numbers, which show that more than 77 million sessions of that game have been played by Nintendo Channel users as of September 1 (up 4.5 million in the last month), for an average of 29.48 sessions per player. That divides to more than 2.6 million Wii Sports users whose gaming has been tracked by the channel. Since almost all Wii Sports owners would be Wii users, we will venture that as many as 2.6 million people are contributing stats. That is up from 2.5 million people when these numbers were ran for August 1.